From Monday to Friday afternoon, senior Ryan Walker assumes his daily routine as a history major. Come every Friday night, though, you can find Walker downstairs at Aunt Chilada’s in Hamden, displaying his talent as a deejay. For Walker, becoming a deejay seemed almost inevitable. “I pretty much have an addiction to listening to and collecting music,” Walker said. This “addiction” may be a good thing, as it has led him to establish himself as a local deejay. Ryan Walker expands his deejay skills in the Quinnipiac community, saying he likes to “take the crowd on a trip” every Friday night at Aunchie’s. Although most deejays tend to have a certain style, Walker attempts to adjust his sets differently for each performance. Factors from the setting of the gig to the vibe he gets from the crowd can shift the kinds of music Walker decides to mix. “My goal every time I play a set is to basically take the crowd with me on a trip by watching for their reactions and trying to read what they’re liking in a song or what they’re disliking, and move to a new song based on that,” Walker said when asked about his style. Clearly, Walker feeds off of the energy of his crowd. When he isn’t in front of a live audience and adjusting his sound to fuel their night, Walker is exploring his own musical interests as a deejay. This “bedroom DJ passion” highlights the true musicianship that Walker possesses. A brief look at his influences also reinforces his dense musical background. “One of my biggest heroes in the deejay world is definitely DJ Shadow. I pretty much worship the dude,” Walker said. Shadow is highly regarded in the deejay community. He is most famous for composing the first album made entirely from samples, “Endtroducing,” which was released in 1996 as his debut album. Although Walker does not play any of DJ Shadow’s music directly, he has gained tremendous insight from Shadow with regards to live performance. “I usually just subscribe to some of his philosophies when it comes to my sets. For instance, the idea that the music I play can be used to unite a group of people,” Walker said. For Walker, seeing a crowd come together through the medium of his deejaying makes the hard work all worth it. According to Walker, there exists a community of deejays at Quinnipiac who all work together and perform live shows. 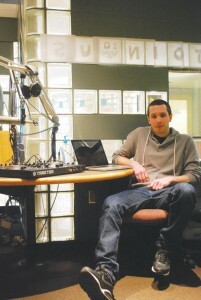 “Working with other people at Quinnipiac is one of the things I love the most about deejaying,” Walker said. Walker has been working with fellow student deejays Ray Decker and Kris Giordano for almost two years. Walker and Giordano pioneered a mixing radio station they streamed through WQAQ last year. Walker gives credit to his friend Austin Sutcliffe, also a Quinnipiac senior, who he claims got him into deejaying. Walker was able to meet someone willing to pressure him to start deejaying; his talent is a musical asset to Quinnipiac’s student body. Walker displays his talents every Friday night at Aunt Chilada’s in Hamden, where students can see him deejaying along with Giordano.